A guide to the differences you'll encounter when trying to select the perfect graphics card for your PC. Figuring out what the best graphics card is for your budget is no small task, but unfortunately that's only the beginning. It doesn't matter whether you're looking at an AMD or Nvidia GPU, once you've settled on a specific GPU—choosing between an RTX 2060 and GTX 1070, for example—you'll be presented with a massive selection of varying card models from at least half a dozen manufacturers. These cards will vary in price, features, clockspeed, warranties and more, so how do you determine which one is actually the best? There's no one solution that will work for every individual, as many items come down to personal preference. Going with the least expensive card for example is a perfectly viable option... most of the time. Here are the major things you should look for when looking for your next graphics card. I've sorted them roughly in order of importance, though again personal preference will play a role. Some people might say that bigger is better, but that's not always true. While larger cards will often cool better and run quieter than smaller cards, there are plenty of PC cases that simply won't be able to accommodate the largest graphics cards. Zotac's Amp Extreme line of GPUs for example are absolutely massive, with triple 90mm fans and a thick heatsink. They take up three expansion slots—one for the actual PCIe connection, and the next two adjacent slots are blocked by the cooler. If you're only running a single card and you have a larger ATX case, a bigger card probably isn't an issue, but for a micro-ATX or mini-ITX build, you'll need to choose carefully. Large cards aren't just about the size, though—weight is another factor to consider. All other items being equal (though they rarely are), a heavier cooler will often work better. That's because the materials will often conduct heat better, allowing for better heat dissipation—copper heatsinks are better than aluminum for example, but copper weighs more. The thing is, a heavy card will often put additional strain on the PCIe slot, and in extreme cases it could even cause the metal on your case's expansion slot to sag and bend. This is especially a concern if you move your PC around a lot. Consider buying a graphics card support brace if your GPU weighs more than a couple pounds, or alternatively get a case where the graphics cards 'hang' vertically. On a similar note, check the video outputs on any card you're considering, especially if you run a dual-monitor setup. Nearly every graphics card will have at least one DisplayPort and one HDMI connector, but everything else is up to the manufacturer. Do you have an older monitor that requires a DVI-D connection? Make sure any card you're looking at supports this! If you need dual DisplayPort or HDMI outputs, again, make careful note of what the card provides, as well as what revision of the spec is supported. Related to this is the subject of power requirements. If you're looking at a graphics card that requires two 8-pin PEG connectors to function and your PSU only has one, you'll need a new PSU. This usually isn't a problem as even modest 500W PSUs typically have two 8-pin connectors these days, which should suffice for just about any modern GPU, but it could be a limiting factor if you're upgrading an older PC and your PSU only has 6-pin connectors. I strongly recommend avoiding Molex to 6-pin adapters, and I'd avoid the dual 6-pin to single 8-pin cable adapters as well. I've also had issues with older PCs that simply didn't handle a higher power card without adding some intake fans to cool things down. Bottom line: You need to make sure your graphics card will fit in your PC, that it supports your desired video connector, and that your PSU is sufficient, preferably before the purchase. Or if you're building a new PC, make sure your case can fit your graphics card and buy a 500W or larger PSU. Even if a card looks like the best deal ever, if it doesn't fit it's a non-starter. It's easy to get hung up on all the fancy features and extras that I'll cover below, but for most people, price is going to be an overriding factor in deciding which card to buy. That's because most graphics cards with the same GPU perform similarly, within a small range, so your ultra-uberclocked extreme model might only be 10 percent faster than a card with reference clocks. If it's only a small increase in price, that's fine, but spending $100 or more extra often means you could have just made the move to the next GPU tier. I'll get into this more in a second, but clockspeeds aren't the only factor. 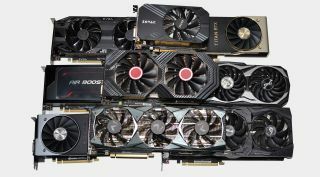 For enthusiasts, if you're willing to tweak and tune your card, the gap between the fastest and slowest card models for a specific GPU are often only a few percent. TLDR: Let your wallet influence your decision in a big way. A lot of people probably put far more emphasis on clockspeed than I think it warrants. "OMG, you got a card with a massive factory overclock!" That's fine, but if the added cost could have been better used to upgrade to a faster GPU, you can easily overspend. For example, there are overclocked GTX 1660 Ti cards that cost basically as much as an RTX 2060. The problem is that a 2060, even at reference clock, is almost universally faster than even the highest overclocks you'll get from a 1660 Ti. That's because it has 25 percent more cores and 17 percent more memory bandwidth, and most overclocks won't make up that deficit. The thing is, higher factory overclocked cards often include better cooling, so it's still something to think about. As far as cooling goes, there are also liquid cooled cards with an external radiator. These often keep temperatures down compared to more traditional solutions, and the weight is less of a factor since the radiator and fan end up being mounted directly on your PC case. They do require more room, however, and costs can go way up for such designs—like $150 or more compared to otherwise similar cards. I'd only recommend a hybrid cooling design if you're getting a top-tier card like an RTX 2080 or 2080 Ti. Clockspeeds and cooling factor into noise levels as well. This is why a lot of people like the triple-fan coolers: they're large and can have three quiet fans as opposed to one or two louder fans. Blowers are often the loudest cards on the market, but they also vent heat out of your case, so they're almost required for cramped ITX builds. Summary: Clockspeeds do matter, but often the performance difference between models is only a few percent. I'd prioritize fan size and cooling over clockspeed, especially if you value silence (and size isn't a problem). Some will say the warranty matters a lot, but I've only had a few graphics cards fully fail during the first few years of use. And now that cryptocurrency mining is in the pits (let's hope it stays there), I suspect the graphics card manufacturers will see fewer RMAs than in the last year or two. Still, having the main component on your gaming rig go toes up is never a good thing, especially if it's a high-end card. Some manufacturers may only give a one- or two-year warranty, others offer three- or four-year warranties, and still others like EVGA offer a step-up program (but only for a limited time). Service and support are a different matter, and far more difficult to gauge. Since you should just use the AMD or Nvidia drivers these days, driver support is no longer a factor, but what happens if your card does fail? Will the company offer cross-shipping on a replacement, or will you end up waiting for three weeks to send a card in for repair and wait for replacement? If you're concerned with speed of response, do some Internet searching to see what others are saying. Brand name is related to this as well. If you absolutely love (or loathe) Asus, Gigabyte, MSI, EVGA, XFX, or whatever, that's fine—go with that brand. For most users, though, brand name on a graphics card means far less than the name of the GPU (ie, AMD Radeon or Nvidia GeForce). Quick take: A longer warranty is nice but ideally you never need it. Buying a higher quality model with a good cooler is usually better than focusing on the warranty. Finally, there's the matter of keeping up with appearances. This is the lowest priority for me personally, but for others it might be a major consideration. Do you want to bling out your rig with RGB lighting? A boring card simply won't cut it. But if you don't have a case window and are more of a function over form type of person, what your card looks like is probably the last thing you're worried about. Aesthetics covers a lot of things, from lighting to colors to style. If you're building a themed PC, you're probably looking at all three. First, there's lighting. Some cards only have a single colored logo (eg, the green GeForce logo on a lot of Nvidia Founders Edition models). Others may have an RGB logo, or RGB fans, or both. If you want to be able to adjust the colors, though, you'll probably need software from the manufacturer to help out, and because there are so many options for RGB lighting, matching up your graphics card brand with your motherboard is helpful—so an Asus mobo and graphics card for example would only need one set of software to control the RGB lights on both. But if you want different brands, there are other utilities that can often handle multiple types of RGB lighting. It's more than just lights, though. A red and black graphics card might not look quite right with a gold and black motherboard. Or maybe your motherboard has angular heatsinks and you want a similar style on the graphics card. Maybe you're going all-in on blue lighting, so you want to select a complementary color, or a white card, or whatever. In short: Only you can decide how important appearance is, and what will look 'best' for your rig, so choose appropriately. Just as there's no perfect PC that will satisfy everyone, there's no single 'best' graphics card model. Some people love the bling, others find it gaudy. Some want a whisper quite build that can sit in their living room entertainment system, others plan on wearing headphones and couldn't care less about a noisy PC—as long as it's fast. And some people want a portable gaming powerhouse, while others have no interest in mobility. With so many models to choose between, it can be hard to figure out which one will best fit your needs, but the good news is that there's a ton of overlap. Nearly every graphics card manufacturer offers multiple models of every GPU, each catering to a different type of user. But if you're not sure which one will best fit your needs, don't hesitate to ask. Just ping me (@jarredwalton) in the comments or on Twitter.